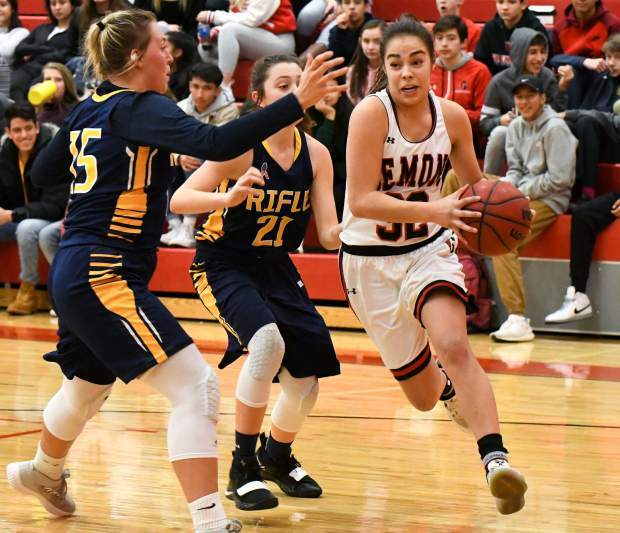 Glenwood Springs Demon Ximena Gutierrez dribbles the ball around the defending Rifle Bears during Friday night's game at Glenwood Springs High School. Glenwood Springs Demon Emily Worline dribbles the ball down the court during Friday's game against the Rifle Bears at Glenwood Springs High School. Glenwood Springs Demon Logan Nieslanik dribbles the ball through the defending Rifle Bears during Friday night's game at Glenwood Springs High School. 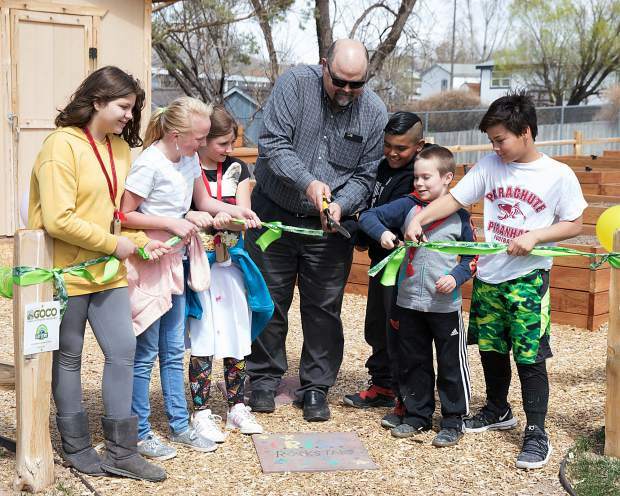 Former Glenwood Springs HIgh School boys basketball coach Bob Chavez is recognized along with members of the 1978-79 team as this year marks forty years after the undefeated team won state. 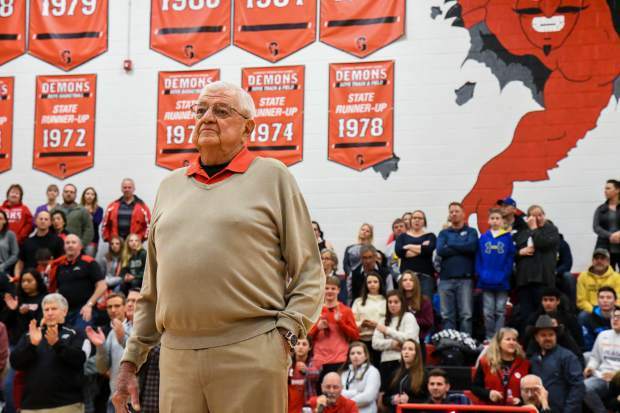 Former Glenwood Springs HIgh School boys basketball coach Bob Chavez interacts with players after a ceremony recognizing the 1978-79 undefeated team that took state forty years ago. Playing in front of some of the greatest players Glenwood boys basketball has ever seen, the current group of Demon hoopers looked to make a statement. 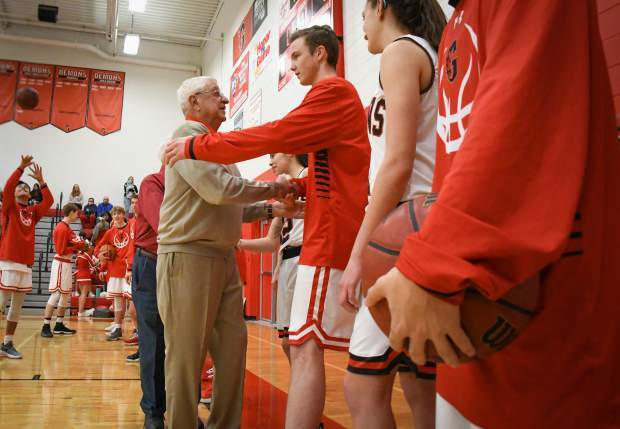 For stretches of game action Friday night inside Chavez-Spencer Gymnasium, Glenwood’s present group of boys looked like a souped up version of the 1978-79 2A state championship team that was honored before the start of the night’s boys game. But Glenwood couldn’t quite put away the rival Rifle Bears on the night, falling behind early before holding off a furious Rifle rally late for a 61-53 win in 4A Western Slope League play. Coming out of the gates following the emotional pregame ceremony, the Bears played the role of spoiler, racing out to a 13-4 lead, going on an 8-0 run on the back of three straight buckets by junior guard Trey Lujan. Two Glenwood free throws by senior guard Angel Garcia and a quick timeout by Heisel helped the Demons shake off the slow start at home, allowing them to claw their way back in the rivalry matchup. A 3-pointer by senior guard Wyatt Ewer and a jumper from senior forward Luke Gair pulled the Demons to within three points after the first quarter of play. Opening up the second quarter, Glenwood started to pressure full court against the young Bears, giving Rifle fits offensively, which in turn allowed the Demons to take control. Ewer hit a 3-pointer to open the quarter tying the game at 14-14 befor a late 9-2 run in the quarter, highlighted by a corner 3-pointer from Garcia, gave the Demons a 32-23 lead at the half. Coming out of the locker room holding a 9-point lead, the Demons pushed that lead to 12 points in the second half as senior center Holden Kleager went to work in the paint, hitting a reverse layup driving baseline, while converting a tough layup through traffic for the 3-point play to pace the Glenwood offense. Rifle didn’t go away though, battling all the way back to within 5 points in the fourth quarter, again riding the hot hand of Lujan. The junior hit a 3-pointer late in the third quarter and then converted a layup and two free throws to pull the Bears to within 5 points at 57-52. As Rifle rallied, the veteran Demons clamped down on any comeback hopes as senior guard Chano Gonzalez hit a layup in traffic, and junior guard Mitchell Burt hit a runner down the lane, closing out the Bears at home in the rivalry matchup. In the win, Gonzalez led Glenwood with 14 points, while Garcia added 12 points, and Ewer added 10 points. Kleager chipped in with 9 points. For Rifle, Lujan poured in a game-high 19 points, while senior Joel Lopez added 8 points. The 4A leading 3-pointer shooter in the state of Colorado had a night to remember Friday inside Chavez-Spencer Gymnasium. 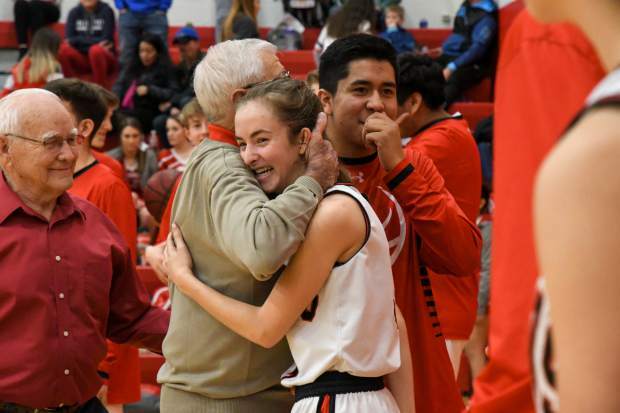 Glenwood senior guard Emily Worline seemingly couldn’t miss against the rival Rifle Bears, hitting five 3-pointers on eight attempts, pacing the Demons to the 26-point win at home in 4A Western Slope League action. 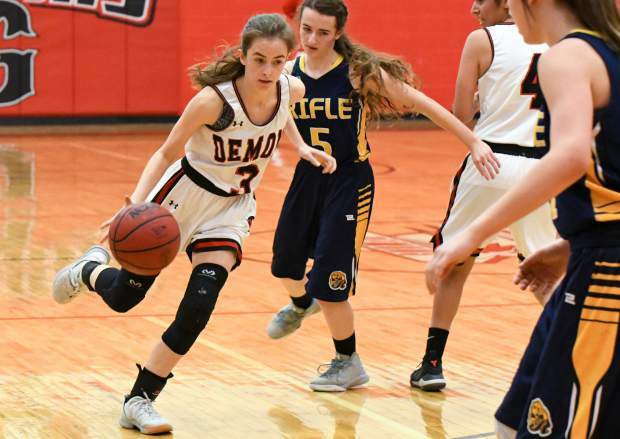 Despite Worline’s hot shooting night, the Demons came out sluggish in the first half against a strong Rifle defensive unit. Glenwood struggled to get good shots, which allowed the Bears to slow things down, forcing the Demons to play their style of game. Late in the first quarter, Glenwood senior guard Ashley Barragnan hit a 3-pointer to push the Demon lead to 9-4, but Rifle’s April Quinones hit a layup near the end of the opening eight minutes, making it a 9-6 game after one quarter of play. 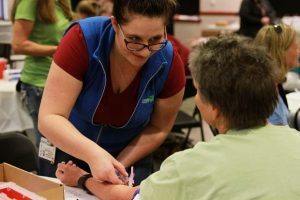 The second quarter saw the Demons jump out to a 13-6 lead as Barragnan scored four striaght points, but Rifle battled back on a putback by senior center Masi Smith, making it 19-13. Glenwood started to get organized offensively late in the quarter, allowing the Demons to pull away for a 9-point halftime lead as Worline hit her second 3-pointer of the game and junior guard Hadley Yellico split a pair of free throws, sending Glenwood into the half with a 25-16 lead. 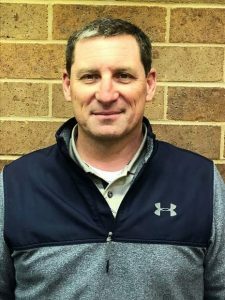 Rifle couldn’t shake off the late second quarter run for the Demons as the Bears scored just three points in the third quarter, allowing the Demons to take a 32-19 lead into the final quarter of play. Smith tried to will the Bears back in the fourth quarter, snatching rebounds left and right before cashing in at the offensive end, hitting three of four free throws and a runner in transition. 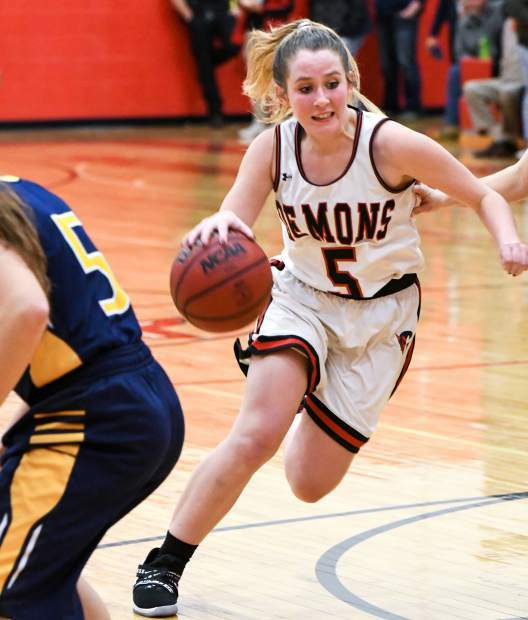 Her individual effort wasn’t enough against the deep Demons as Glenwood closed out the win with a layup from sophomore forward Graci Dietrich, and two free throws from freshman guard Maddie Moser. In the win, Worline led the Demons with 17 points, while senior guard Ximena Gutierrez added 12 points. Barragnan joined her fellow seniors in double figures with 11 points of her own. For Rifle, Smith led the way with 10 points, while freshman Jamie Caron chipped in with 6 points, and Quinones added 5 points.